Argentina is a cultural destination that will win you over through your stomach. Home to 45 million people and famous for the tango, it’s also known for the popular and savory empanada. What’s an empanada and why is it such a big deal? We’re exploring the complete history of Argentinian empanadas and why they’re so popular. If you’re not already craving one, you will be after reading this. Empanadas come baked or fried and shaped like triangles or half-moons. Recipes vary on the elegance or simplicity of the dish, but the basic ingredients are always the same. You might recognize the empanada if you’ve eaten pasties while traveling through England. The basic ingredients combine three things: a dough, a filling, and a cooking method. Popular fillings include ground or minced beef, chicken, or even a ham-and-cheese combo. You can also buy them filled with vegetables or fruit. If you go to an empanada restaurant, you can find endless varieties. This pocket-sized meal can be found everywhere while visiting South America. Beef-loving Argentina loves to boast the recipe as its own, and every province has its own recipe. Everyone loves itbut where did it come from? The empanada’s origin is unclear, but the first mention of an empanada goes back to medieval times. Historians have discovered a Catalan cookbook that has (perhaps) the earliest empanada recipe. A man named Ruperto de Nola published it in 1520. It’s believed that early Spanish immigrants carried the recipe to Argentina during the 16th century. The diet of medieval Spain included bread, legumes, and different types of meat. All of these ingredients go into traditional empanadas. The staple ingredients for empanadas have changed over the years. 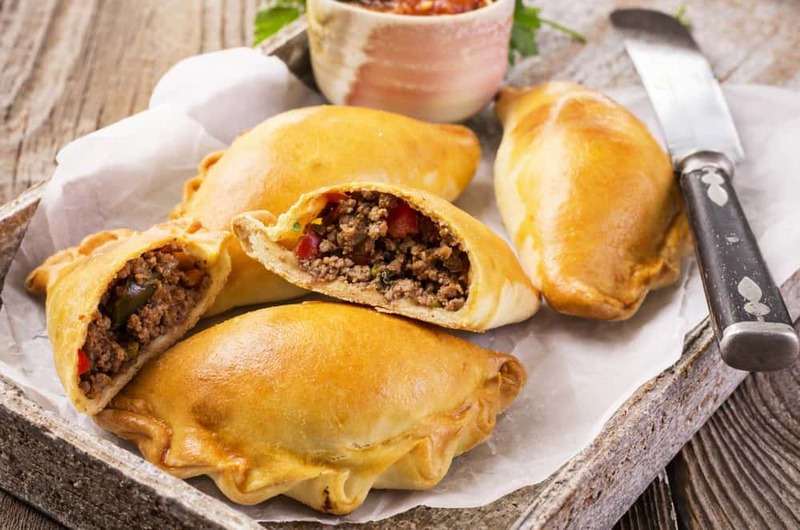 Historically, an empanada was a simple bread dough filled with oxen meat, pork, or beef. Today, the empanada’s filling will depend on what is seasonal and fresh. In Argentinian history, the empanada was once known as the working man’s meal. This is because it contained a full meal that was easy to carry to work. Although we don’t call it that today, the ease of the pastry dish is not lost upon recent generations. It’s still a staple item in Argentina food culture. Many families will cook empanadas as an easy dinner meal or party food. Street corners and fairs will feature fresh empanadas as take-and-go street food for walkers. Also, popular restaurants will focus on unique and extravagant empanada recipes. The Argentinian empanada is as historic as Argentina’s infamous cookie, and it’s a must-try for anyone traveling to the area. Although it’s one of the oldest recipes out there, the empanada is still enjoyed as a popular meal today. Many like to boast that it comes from the kitchens of Argentina. Either way, it’s a delicious and savory pastry that’s eaten as a staple in Argentinian homes. Want to add traditional meals to your routine? Grab an Argentinian empanada and learn more about Argentine foods today.